Coral are offering the chance to turn £1 into £1 million with their fantastic Football Jackpot. Every week we post our tips and predictions on the outcome of the selected 15 matches. Pick with us your winners by 3PM every Saturday! WHAT IS CORAL FOOTBALL JACKPOT? 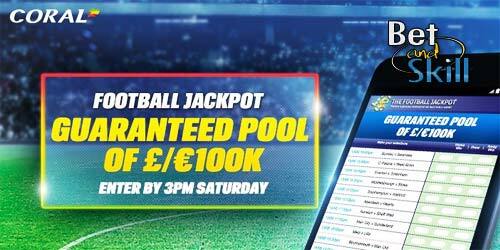 Football Jackpot is a pool betting product promoted and operated by Coral on 15 pre-selected football matches (‘Pools‘). 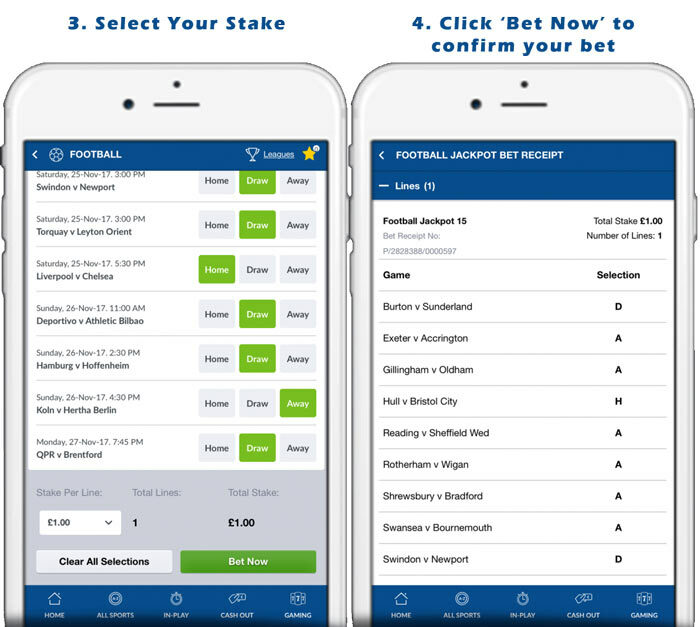 It requires customers to predict the outcome of fifteen matches over the weekend for a £2 bet, and the total jackpot is then shared between any winning customers. HOW TO PLAY CORAL FOOTBALL JACKPOT? You can play Coral Football Jackpot both online and in shops. If you register with Coral Online Sportsbook you will also get £20 in free bets! The minimum stake per line that you can bet is £1 and the maximum is £20. You can select several outcomes on the same match if you’d like; so if you’re not sure if it’s going to be a draw or a away win, for example, then you can select both. Obviously the more selections you make the more possible permutations there can be, meaning that your overall stake will increase. The number lines is automatically calculated on your coupon so you can see exactly how much your bet will cost before it is placed. Go to Football Jackpot and predict the outcome of 15 matches on the Football Jackpot Coupon. Punters can check out our Football Jackpot tips every week. Take a look below. Correctly predict the results of all 15 games to win a share of the jackpot pool (£100,000 guaranteed). The jackpot pool represents 70% of the overall net pool. if the net pool is £1million, then the jackpot pool will be £700,000. If you are the sole winner then the jackpot is all yours. If there are multiple winners then the jackpot will be split. Correctly predict 14 out of 15 matches to win a share of the 1st consolation dividend which represents 20% of the net pool. So if we consider a £1million net pool, you’ll stand to win £200,000. 2nd Consolation Dividend – Correctly predict 13 out of 15 matches to win a share of the 2nd consolation dividend which represents 10% of the net pool. Using our example, this would be £100,000. The minimum consolation dividend will be £1.10 for a £1 stake, no matter how many winning entries. 1XBet also offer a jackpot of 15 matches. You receive cash rewards for 9 to 14 correct scores and win the ultimate prize for 15/15 correct predictions. But before you play the jackpot, you need to register via this link (Click here to register). 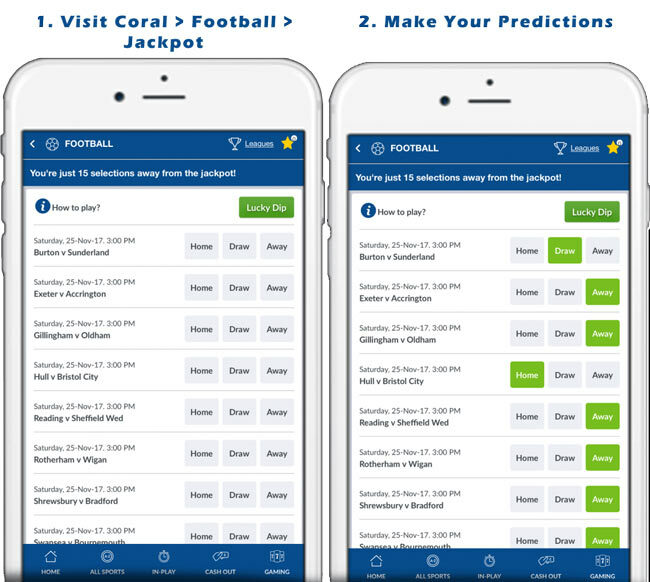 "This week's Coral Football Jackpot Tips & Predictions"